8 scheduled sessions are divided into 3 sections: Introduction to Curatorial Practices, Cases of Study’s Modules focusing on Curatorial Theory and Practice; and complementary activities (see Program of Theoretical Sessions). 2. Session by José Roca, Adjunct Curator Estrellita B. Brodsky of Latinamerican Art in Tate Modern (London) and Director of FLORA ars+natura, (Bogotá). 3. History of Curatorship. Session by Conrado Uribe, Artistic Director of LOOP Festival 2014 (Barcelona); From artist as curator to curator as artist, by Luis Guerra. Artist, theoretician and writer. 4. Session by María Inés Rodríguez, Director of CAPC Musée d´Art Contemporain Burdeos, Chief Curator of MUAC Museo Universitario de Arte Contemporáneo, 2011-2013 and Director of MUSAC Museo de Arte Contemporáneo de Castilla y León, 2009-2011. 5. Session by Maria Hlavajova, Director of FORMER WEST, Artistic Director of BAK Basis Voor Aktuel Kunst (Utrecht), Curator of the Roma pavilion for the 54 edition of Venice Bienale, 2011 and Curator of the Dutch pavilion fot the 52 edition of the Venice Bienale, 2007. 6. Session by Beatrice Von Bismarck, Professor of Art History and Visual Studies in HGB Hochschule für Grafik und Buchkunst (Leipzig). Editor of Cultures of the Curatorial. 8. Guided tour of the exhibition Futurs abandonats. Demà ja era la qüestió. 9. Training seminar with Beatrice Von Bismarck. The research group AGI presents the second edition of the training seminar ON MEDIATION , whose first edition gathered more than 30 participants from 8 different countries who were asked to generate three different curatorial projects in collaboration with the platform iDENSITAT, the Fundació Antoni Tàpies archive, the Fundació Guasch Coranty, and the Cercle Artistic Sant Lluc. These three exhibitions were the outcome of the first edition of a seminar that arises from the need to offer a university training program that is able to provide both theoretical and practical tools for the creation process of an exhibition. From the research group AGI and as a result of the recent profesionalization of the figure of the curator, we believe it is necessary to detail the results from contemporary curatorial practices understood as a mediation mechanism, ‘thinking beyond the specialized role’ and creating a space for debate ‘on the cultural location of this mediation’ (Lars Bang Larsen & Soren Andresen, 2006). 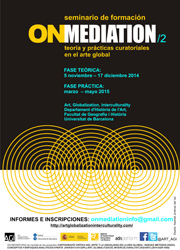 ON MEDIATION/2 Theory and Curatorial Practices in the Global Art, is a theoretical and practical training seminar, where various perspectives are addressed in order to identify different methodologies to promote the curatorial practice towards a multidisciplinary scenario. Thus, the seminar will be organized through a first theoretical phase of lectures led by curators of recognized international experience and a second practice phase where participants, by previous selection, can develop the ideas put forth by the mentored curatorial projects that will be presented in ADN Platform in May 2015. This seminar is open to artists, curators, critics, students, researchers and other collectives interested in developing their curatorial concerns beyond the disciplinary scope, deepening the practice of cultural mediation and questioning imposed models. All registered participants will receive a certificate of attendance, online work materials, personalized tutoring and specific monitoring of curatorial projects. Curatorial turns in contemporary art by Anna Maria Guasch. This is an Introductory Session, presenting the coordinators and participants of the Training Seminar On Mediation/2. 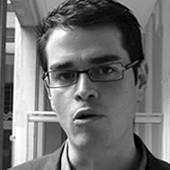 José Roca, Adjunct Curator Estrellita B. Brodsky of Latinamerican Art in Tate Modern (London) and Director of FLORA ars+natura, (Bogotá). Two topics to be covered: History of Curatorship by Conrado Uribe, Artistic Director of LOOP Festival 2014 (Barcelona); and From artist as curator to curator as artist, by Luis Guerra. Artist, theoretician and writer. 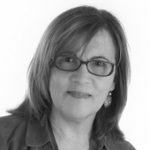 María Inés Rodríguez, Director of CAPC Musée d´Art Contemporain Burdeos, Chief Curator of MUAC Museo Universitario de Arte Contemporáneo, 2011-2013 and Director of MUSAC Museo de Arte Contemporáneo de Castilla y León, 2009-2011. Maria Hlavajova, Director of FORMER WEST, Artistic Director of BAK Basis Voor Aktuel Kunst (Utrecht), Curator of the Roma pavilion for the 54 edition of Venice Bienale, 2011 and Curator of the Dutch pavilion fot the 52 edition of the Venice Bienale, 2007. Beatrice Von Bismarck, Professor of Art History and Visual Studies in HGB Hochschule für Grafik und Buchkunst (Leipzig). Editor of Cultures of the Curatorial.